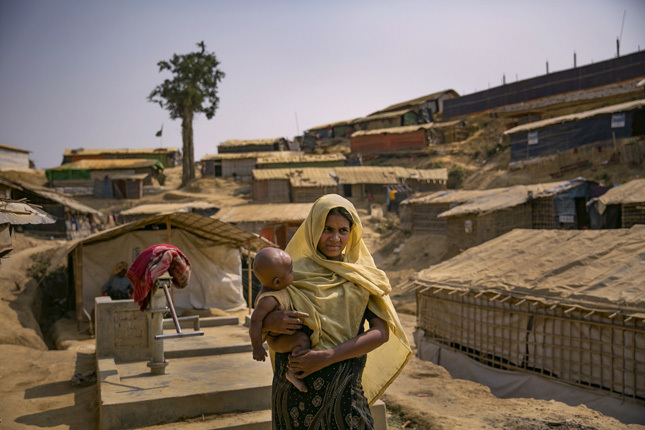 This article is the first in a three-part series on safe motherhood in conflict settings. The three delays of maternal mortality—delays in seeking care, reaching care, and receiving care—are exacerbated by conflict and cause hundreds of preventable deaths every day. Join experts at the Wilson Center on August 28 for a discussion on maternal health and armed conflict. The decline was due, in part, to lack of adequate information about available services, which was especially acute when refugees and displaced women were not formally accounted for—if they were staying with relatives, for example, or with friends. These women were often overlooked when providers relayed important health information to displaced communities. Even when women are fully informed, some still do not to seek out medical attention. Syrian refugees in Za’atri Camp and Irbid City in Jordan shied away from the health facilities due to their poor reputation, according to an evaluation published in Conflict and Health in 2015. In Za’atri Camp, many women knew they could access services for free, but were hesitant to visit. “A few women in Za’atri Camp described deterioration in the quality of services over time, including a lack of physical examinations and drugs and unqualified health providers,” the evaluation reports. The disrespect and abuse that women often face during pregnancy and childbirth only gets worse in times of conflict. The urgent need in crisis settings sometimes leads the humanitarian community to overlook the quality of care. For example, a 2017 white paper on respectful maternity care describes the case of Amal, a 17-year-old from Yemen, who gave birth in a NGO-funded health facility. “When she delivered her last child, the health providers told her not to cry, scream, or call them when she feels pain,” the authors reported. But people in crisis settings don’t get to choose their health providers; in some settings, women must choose between delivering in an abusive setting or taking the risk of delivering at home. Additionally, resource constraints make health facilities less likely to provide sufficient information and privacy for pregnant women, and cultural and language barriers can make it difficult to obtain legitimate consent for procedures, such as caesareans. Minimizing the delay in seeking care may take a targeted, integrated approach, including innovations that are designed to create more “demand” on the patients’ side. However, addressing the underlying factors that often result in disrespect and abuse by health providers—such as weak infrastructure, traumatic and stressful working conditions, and a lack of resources—is fundamental. The Global Respectful Maternity Care Council called for strengthening accountability in the care for pregnant women. The council recommended deploying social accountability innovations, such as citizen monitoring and community “scorecards,” in addition to a reinforced global commitment to the Core Humanitarian Standard on Quality and Accountability. While providing maternal and reproductive care for conflict-affected populations is crucial, ensuring that this care is of the highest possible quality is key to reducing delays in seeking care. 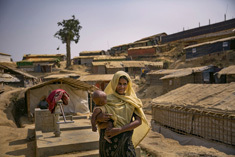 Photo Credit: A Rohingyan woman walks past a water pump in Balukhali camp, March 2018. Photo by UN Women/Allison Joyce.